I most appreciate the knives that take thought to comprehend, and the Cold Steel Espada V is a great example of a knife you won't completely get the first time you see it. Cold Steel continues to take chances and express some good ideas. This one is worth a look, and then another look. 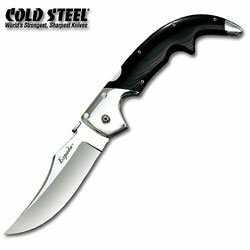 Built of Japanese 8A stainless steel, a 7075 aluminum handle frame nearly as durable as titanium alloy, and G-10 handle slabs that withstand weather and chemicals and still look good, the Espada isn't the usual pocket folder. The first thing I noticed was the tab at the base of the blade -- it reminded me of the trademark Laguiole bee that has embellished traditional Spanish pocket knives for at least a couple of centuries. The thought behind this massive folding knife -- an overall length of 12-1/4 inches with the 5-1/2-inch blade locked in open position is definitely large for a modern folder -- is old Spanish, but redesigned for modern circumstances. Instead of being just a pocket utility knife, the Espada is a pocket sword. It's a little like a TDI tactical knife with more class. Both types base handle design on pistol grips -- something more familiar to modern hands than the grip of a knife or sword -- but the Espada does this with style. The grip design is more like the old flint lock pistol than a Police Special, but it fits the hand well. As it turns out, the tab at the blade's base isn't a concession to tradition, but something entirely new. That little steel plate is designed to catch on the edge of your pocket as the knife is drawn, boosting the blade open. Smaller versions open with the usual thumb stud.